You don't need to feel guilty when you enjoy crisps anymore. There is absolutely no frying.. so these are healthier and we have not compromised on taste. Cut potato: Slice the potato into thin round slices of even thickness (around 1/4 of a cm) and place them in a clean tissue. Place another tissue over the potato and gently put some pressure to squeeze out excess water. Season the potato: Place a potato in a single file on a microwave friendly flat plate. Do not overlap the potato slices. Using a pastry brush, brush some olive oil over the potato slices and then add freshly ground rock salt and pepper generously. Now turn the slices the other way round and repeat by brushing with oil and seasoning with salt and pepper. Bake the crisps: Place the plate in the microwave and cook in high heat for 3 mins. Then flip the potato slices and cook again in high heat for 3 mins. 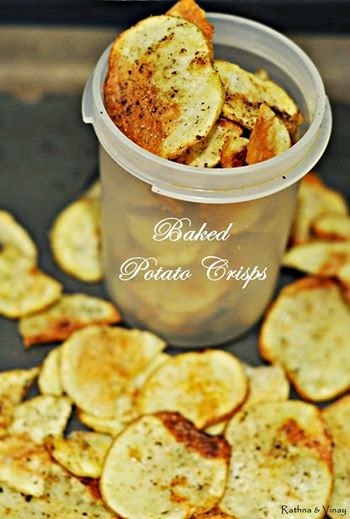 Allow the crisps to cool for a few mins and enjoy them. Store these crisps in a air tight container and these will last. Depending on how powerful your microwave is, the time it takes to cook the crisps may vary. The crisps will start getting a slightly brown which will mean they are done. The pepper added must be freshly ground and not pepper powder. Rock salt can be replaced with regular table salt. Try these crisps with beetroot, tapioca and sweet potato. They taste just as good. Food seasoned with love.Recipes and food photography.